The most hype moment of a big San Francisco Street Fighter V event this week came during a spur of the moment challenge from the crowd. And it’s a lesson about the danger of being a little too brave. The event was a big party involving Capcom and fighting game enthusiast Lupe Fiasco. Both were celebrating Lupe’s forthcoming album DROGAS Light and the release of the next Street Fighter V character, Kolin. With special guests like Murs and Del the Funkee Homosapien as well as a full card of high-level exhibitions, the event was primed to be an exciting one. The evening’s planned main event involved, Du “NuckleDu” Dang, the greatest Street Fighter V player in the world, handily defeating Ricki Ortiz in the Capcom Cup rematch. Dang is only 20 and, after winning a cool $230,000 at last year’s Capcom Cup, he has earned respect but also placed a target on his back for anyone look to raise their own profile. Dang’s work seemed done for the night until a surprise challenge from Ryan “Filipino Champ” Ramirez. After the night’s planned exhibitions failed to build much hype, Ramirez stepped up to face the Capcom Cup champion, and Dang was up for the challenge. Master of ceremonies Mike Ross abdicated responsibility for setting the match parameters to Lupe himself, and a first-to-five fight was soon underway. To be clear, Ramirez is an incredible player in his own right. Although he’s widely known as an accomplished Ultimate Marvel vs. Capcom 3 competitor with an Evolution Championship Series title under his belt, he also has the ability to make waves in any Street Fighter tournament he enters. No matter how the challenge materialized, this wasn’t an errant or sporadic move on his part; Ramirez can compete with the best of them, and he knows it. What resulted was perhaps the most exciting set of the event, if not one of the better Street Fighter V matches of the past year. Dang was an absolute wrecking ball with R. Mika, rushing down his opponent as if the professional wrestler hadn’t sustained any nerfs in the most recent patch. Unlike other players, however, Ramirez isn’t one to be frazzled. Utilizing his trademark Dhalsim, the challenger picked his moments wisely, controlling space and applying offense in the methodical style his character is known for. That’s not saying Mika wasn’t Mika, allowing NuckleDu to make a number of smart reads and steal rounds on a regular basis, but Ramirez put up an amazing fight. Although it was a losing effort, Ramirez definitely got his shots in, making probably the smartest play of the entire match in the process. With time running down at the end of the sixth game, Dang appeared content to sit back and get a timeout win thanks to his decent health advantage. 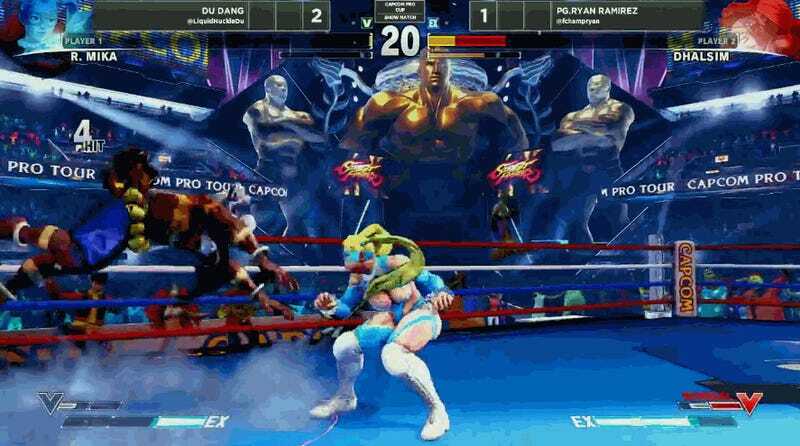 He watched Ramirez from the corner, carefully avoiding Dhalsim’s long limbs. After Ramirez correctly blocked R. Mika’s assist partner, he successfully baited Dang into moving out of the corner with a fireball. As Dhalsim players typically teleport behind their opponent after using the projectile in an effort to force them into a difficult blocking scenario, Ramirez faked by teleporting in place, allowing him punish Dang’s escape and secure the round with a narrow life lead. But that was far from the only excitement this event had to offer. During a special Street Fighter V tournament, player were allowed to try out Kolin before her official release later this month. A handful of competitors would try their luck with the icy newcomer, but Long “LPN” Nguyen, a multi-character specialist since the days of Street Fighter IV, learned her intricacies fast enough to place third. Ramirez wasn’t the only Dhalsim. Leah “gllty” Hayes, visiting from St. Louis, Missouri, ended the night in second place behind solid gameplay of her own. Known as something of a troll in the fighting game community, Hayes consistently takes up residence in her opponents’ heads with both real-life and in-game antics. Near the beginning of the tournament, she was able to score three straight perfects against local competitor “Hotrod” (Update 7:10pm—The piece initially misidentified “Hotrod” as Rodney “Hotrod” Tse), the last of which was secured in spectacular fashion. While high-level tournaments remain the pinnacle of competition, events like the one that took place in San Francisco on Wednesday night are the perfect place to truly understand the appeal of the fighting game community. Intense matches, random challenges, and exciting commentary (helped along by a tiny bit of alcohol) combined to create a wonderful viewing experience, even if, like your author, you happened to be stuck at home.